Texted Jeff all the details we had… he took off with a crate and a heavy blanket. In a short amount of time, Jeff called back to say that he had the eagle in the crate and would take it home — off to Fort we went! 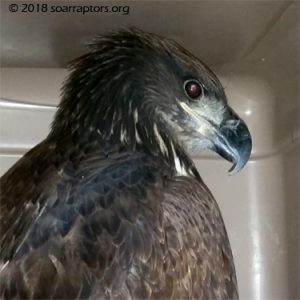 This hatch-year female bald eagle has sensitivity in both wings and hasn’t missed many a meal, weighing in at 10.5 pounds. She has much bruising in her wings and torso. After being hand fed for a week, she has now 'graduated' to eating cut-up food on her own. She is still in ICU so she doesn't try any dramatic moves just yet. After a short stay in a small flight pen, JJ has graduated to the 100" flight pen.